The findings are part of a four-article collection about Juno science results in the March 8th edition of the journal Nature. In the year and a half NASA's Juno spacecraft has been orbiting Jupiter, the science team led by Southwest Research Institute's Dr. Scott Bolton has discovered that the orange and white bands that characterize Jupiter's outer atmosphere extend thousands of miles into the gas giant's atmosphere. 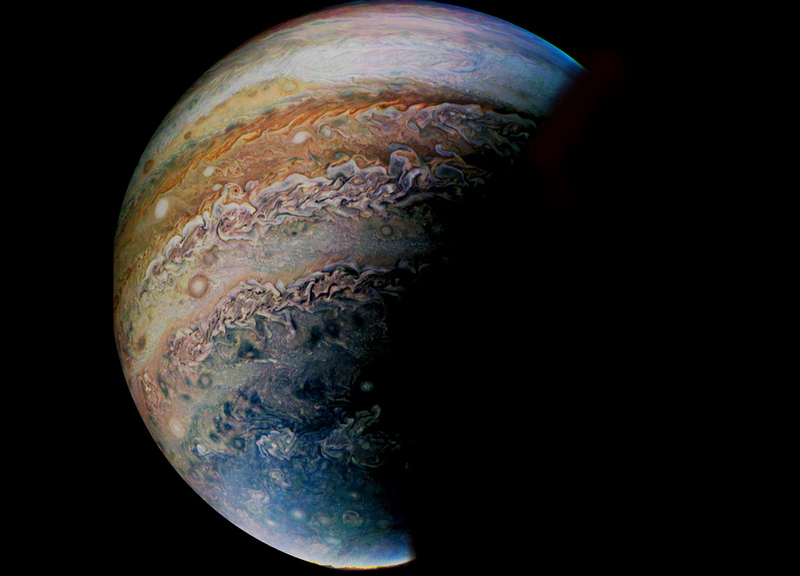 "With Juno only about a third of the way through its primary mission, we are being presented with a whole new Jupiter that is shaking up our basic understanding of giant planets throughout the universe," said Bolton, principal investigator of the mission and a coauthor of the Nature papers. "Surprisingly, the Jupiter we grew up knowing and loving, dressed in gorgeous colorful bands across its midsection, is now known to be beautiful down deep as well." The four Nature articles focus on the structure of Jupiter's deep interior and the surprising discovery of clusters of cyclones encircling Jupiter's poles. One paper discusses Juno's unique orbit, and how the spacecraft's precise radio tracking system measures Jupiter's gravity field. "This Juno system is so technically advanced that measurement capabilities have been improved by orders of magnitude in precision," Bolton said. This improved accuracy allowed scientists to detect an asymmetry in Jupiter's structure at depths near 3,000 km. "This asymmetry mirrors what we see in Jupiter's cloud layer, those colorful bands that blow across Jupiter." A second paper describes how these belts and zones manifest themselves as jet streams deep in Jupiter's atmosphere. "This discovery surprised the entire team," Bolton said. "The Juno data show that what seemed like a weather pattern on Jupiter extends down well below the depth where sunlight penetrates, which means that something other than weather may be driving these forces. "In total, Jupiter's jet streams contain about 1 percent of the gas giant's mass. That means a mass equivalent to about three Earths is moving around Jupiter in the form of jet streams," he continued. "That is a lot of atmosphere to be moving with jet streams. On Earth, our atmosphere is less than a millionth of Earth's mass!" A third paper looks at how the symmetric layers of Jupiter work and reports that below the jet stream layer, Jupiter rotates as a rigid body. "Somehow Jupiter transitions from the jet stream layer that rotates like the top cloud layer to a rigid body deep inside where everything moves together," Bolton said. "The transition might have something to do with the creation of Jupiter's strong magnetic field." Understanding the transition between the atmospheric layer and the more rigid layers that lie beneath will be revealed during the remainder of Juno's primary mission over the next couple of years. The fourth paper provided the first detailed look at how the familiar bands give way to giant cyclones organized in geometric patterns at both of Jupiter's poles. "Before Juno, scientists knew little about Jupiter's poles due to the Earth's perspective of the planet," he said. Previous spacecraft flew past the gas giant at an equatorial level, capturing wonderful views of the zones and belts but revealing little about its polar regions. "Turns out, Jupiter is hardly recognizable from a polar perspective." Visible and infrared images obtained from above each pole during Juno's first five orbits reveal persistent polygonal patterns of large cyclones. In the north, eight circumpolar cyclones surround a single polar cyclone. In the south, one polar cyclone is encircled by five circumpolar cyclones. "These cyclones are huge with winds speeds as great as 220 miles per hour," Bolton said. "These novel features seem to exist in harmony, close together and persistent. They are surprisingly different from the single storm pattern that the Cassini spacecraft measured at Saturn's poles." Launched in 2011, Juno arrived at Jupiter in 2016. Every 53 days, the spacecraft swings in close to the planet, studying its auroras and probing beneath the obscuring cloud cover to learn more about the planet's origins, structure, weather layer and magnetosphere. "Clusters of cyclones encircling Jupiter's poles" by Alberto Adriani et al. [https://www.nature.com/articles/nature25491].